Circular Agronomics > Circular Agronomics has started! On the 1st of September, the Circular Agronomics project was officially launched! A good management of carbon (C), nitrogen (N), phosphorus (P) and potassium (K) is crucial to maintain a fertile and healthy soil and allow adequate plant growth and development. Currently, half of the N and P applied annually to croplands in the EU is derived from non-renewable sources such as phosphate rock or is produced by processes which consume large amounts of fossil fuels like natural gas. In addition to this, large amounts of N and P are lost from agricultural systems resulting in large losses of nutrients and carbon into the environment with significant negative impacts on soils, water and air and constituting unacceptable health and environmental costs. With a consortium of 19 members from 9 EU countries and a federation of farmers from 10 East African countries, Circular Agronomics will contribute to making the European agri-food system an integral part of a Circular Economy. This will be achieved by increasing resource efficiency and the reuse and recovery of nutrients while addressing associated environmental challenges such as greenhouse gas (GHG) and ammonia emissions and the eutrophication of water bodies due to excessive nutrient leakage. This can be achieved through better soil, crop and livestock management and the recovery and reuse of nutrients and carbon from manure, food waste and wastewater. 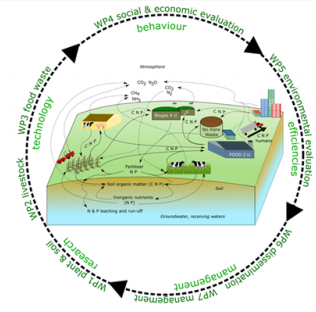 The solutions will focus on the production of novel soil organic amendments, improving crop and grassland management to optimise nutrient cycling, addressing livestock management to minimise GHG emissions and contributing to the valorisation of recovered nutrients and carbon through the processing of manure, digestate and food waste as well as the treatment of wastewater from food-industries. Six study sites will show examples of good practices throughout the EU. Copyright 2018 Circular-Agronomics. All rights reserved.